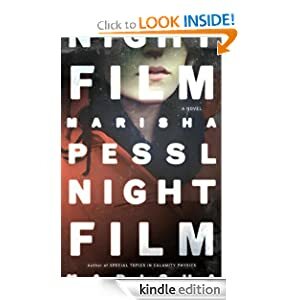 Night Film by Marisha Pessl is a massive labyrinth of mystery and horror. It is, at times, dark and deeply frightening, but there are other moments in which it is revealed for what it is: a carnival fun house built for the sole purpose of entertainment. The novel is narrated by your basic film noir hero: Scott McGrath, a hard-drinking, ruggedly handsome journalist, who has fallen from grace due to libelous claims he made against a popular and reclusive horror film director, Stanislas Cordova. Now, years later, Cordova’s young and beautiful daughter, Ashley, is found dead in an abandoned New York City warehouse, and though the papers write it off as a simple suicide, McGrath suspects otherwise. With the help of two oddball sidekicks, he opens up his investigations on Cordova, eventually exposing a tangled web of possibilities – everything from black magic to child murder to the disturbing lengths Cordova might have gone through to film his horrific movies. The entertainment here is fear and suspense, and for the most part it works. There were points in the narrative – especially when McGrath breaks into Cordova’s private estate and experiences a fun house of his own – that gave me chills and kept me reading way past my bedtime. And trust me, I certainly thought twice about reading Night Film right before falling sleep. In some ways, Pessl’s novel reminds me of the first season of the American Horror Story television series: a pull-out-all-the-stops, creepy for creepiness sake, smorgasbord of Hollywood horror — a book to make your heart race and your fingers flip eagerly to the next page. Was it a little over the top? Yes. It was way over the top. But that’s why it was entertaining. And, just like a fun house, Pessl’s Night Film is interactive. The novel is littered with artifacts: newspaper articles (which look as if you were reading them online), police reports, hospital records, webpages – all the things that McGrath himself is reading to help him understand Ashley Cordova’s death. The first of these, an online New York Times article, complete with reader comments, is so realistic, I stopped reading for a moment and googled Stanislas Cordova to see if he was an actual director. He’s not, of course, except in the minds of Pessl and her readers. When I finished the book, I learned that there are “interactive touch points” throughout the text, and that by downloading the Night Film app onto your high-tech device, you can unlock extra images and audio material. Now, I must admit, this frustrated me a bit because I’m not a high-tech person. “I have to download an app?” I grumbled. But, I got out my ipad and downloaded the app. Unfortunately, (maybe because I had read the book on my Kindle? ), I couldn’t figure out how to get the app to work. I gave up pretty quickly, but I recognize that this is potentially a really cool thing, and could add to the fun house appeal of Night Film – just when you think you’re finished, there’s another dark corner to turn. And that is actually a good description of Night Film’s story: just when you think it’s over, there’s more. Just when you thought it couldn’t get any darker, or weirder, it does. Just when you think the mystery is solved, there’s another layer to unpeel, another character, lurking in the shadows, all-too-willing to give his or her confession. It’s a very long, deep labyrinth, and you’ll need a good chunk of time and patience to traverse it. And this twisting labyrinth, although impressive, is one of the problems I had with the book. There were too many twists and turns and false endings, each one becoming more outlandish than the last. The novel started out realistic, making me wondering if Cordova was real, but by the end the story was very clearly fiction, and contained a few too many loose ends for my liking. Not only are the circumstances unrealistic, some of the characters are, too. Take, for example, the two twenty-somethings who end up helping McGrath with the investigation: Hopper, an attractive drug dealer, and Nora, a struggling actress. Hopper’s character is inconsistent, but at least I understand why he wants to be involved in the case – he was in love with Ashley as a teenager. Nora, an eccentric girl who claims that her best friend was an eighty-year-old female impersonator (and dresses in his old drag clothes), had no real connection with Ashley, and her willingness to go to insane lengths for the investigation is never quite explained, except for perhaps with a passing crush she has on McGrath. “The truth.” That is the MacGuffin being searched for throughout the entire novel. Is it ever found? Well…let me ask you this: when you emerge into the bright sunlight after wandering through a haunted fun house of mazes and mirrors, do you suddenly have a clear knowledge of life and death and answers of the universe? Or do you say, “whoa, that was fun,” and then go get yourself a corndog? Night Film is a long, wild, and at times ridiculous, ride. It is a page-turning spider web of mystery and mayhem that tries for the shock and suspense of Gillian Flynn’s Gone Girl but doesn’t quite get there. Still, it’s highly entertaining, often clever, and the perfect novel to get lost inside on a dark and rainy weekend leading up to Halloween.